This is such a refreshing salad and tastes incredible when had chilled, actually you are supposed to have it chilled only. 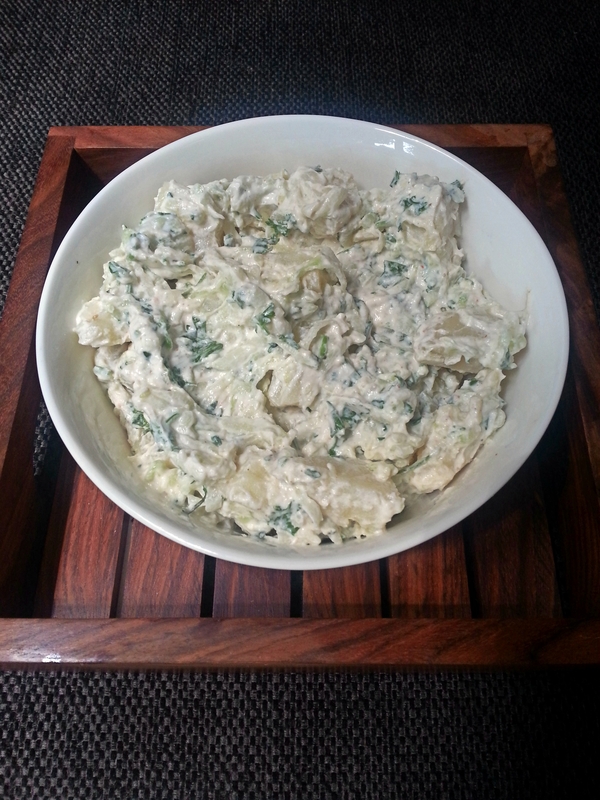 Many people consider eating potato salad for lunch unhealthy or gluttonous and nutritionally unbalanced well ummm….. I don’t give a damn! I love this salad it is so full of flavours you have garlic and yogurt, some lemon, cold grated cucumber so basically its Yum-O! My girls love it and they even enjoy having it with baked nachos. I personally feel this salad is so good for summers so cooling, you only need some lamb kebabs on the side and you are good to go, call over your friends and just dig in. 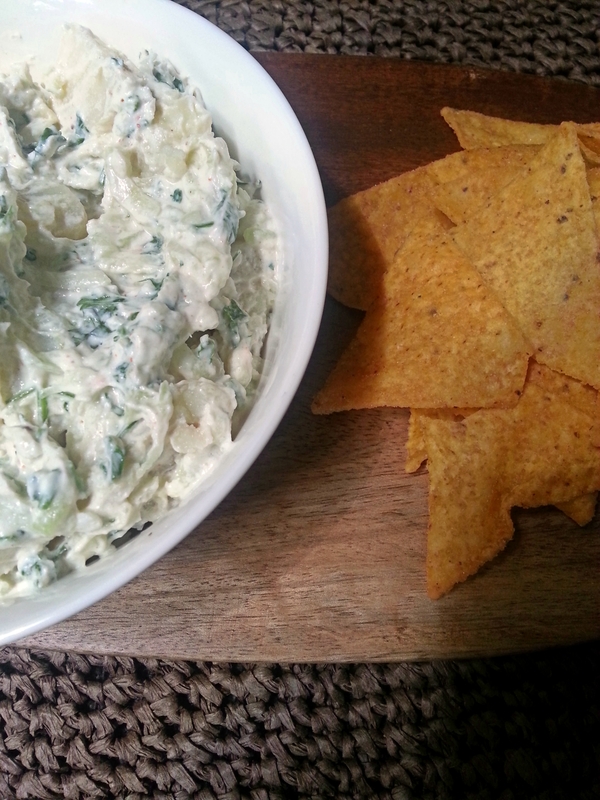 And because it has yogurt and no mayonnaise its light and anti- mayonnaise lot will love it. In a large mixing bowl stir together yogurt, lemon juice, garlic, mint leaves, green chilli, salt and lots of freshly ground black pepper. Coarsely grate the cucumber and sprinkle over salt, mix well, put into a colander and suspend over a deep bowl and leave it to drip for at least an hour. Manually squeeze out as much moisture as you can from the cucumber, add to the yogurt mixture. 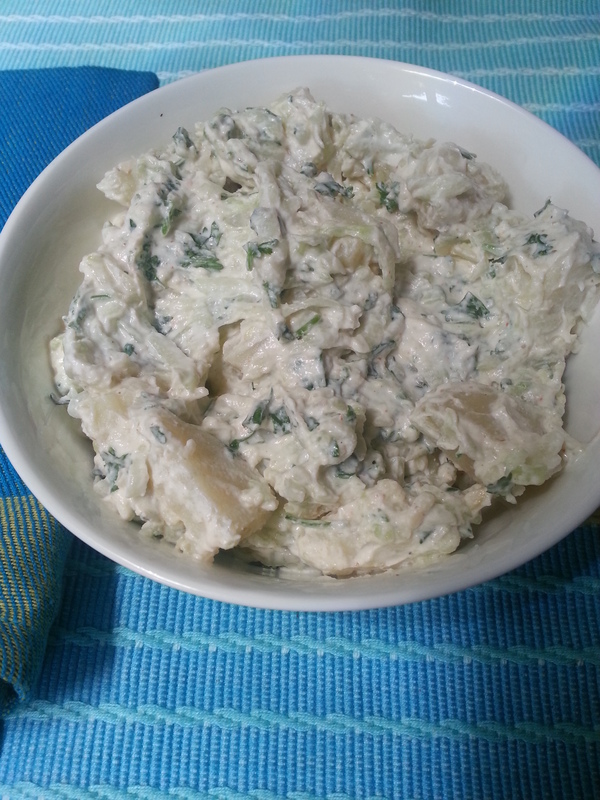 Cut your boiled potatoes into medium size chunks and add to your cucumber yogurt mixture and stir to coat. Adjust seasoning to taste and keep it in the refrigerator to chill. I love potato salad. I ate so early today, I’m now feeling hungry again and this yummy salad makes it worse!